Happy Holidays [H5110] - $8.50 : Yarn Tree, Your wholesale source for cross stitch supplies. Cross stitch pattern by Country Cottage Needleworks. The sight of fresh snowflakes falling from the cold, brisk, winter air. As you peak through the limbs of the pine trees, the hillside begins to look like a winter wonderland. 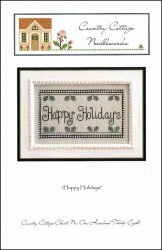 Snowflakes fall among the pine tree branches with "Happy Holidays" stitched in the middle. It's a snowy splendor. Stitch count 154w x 86h.